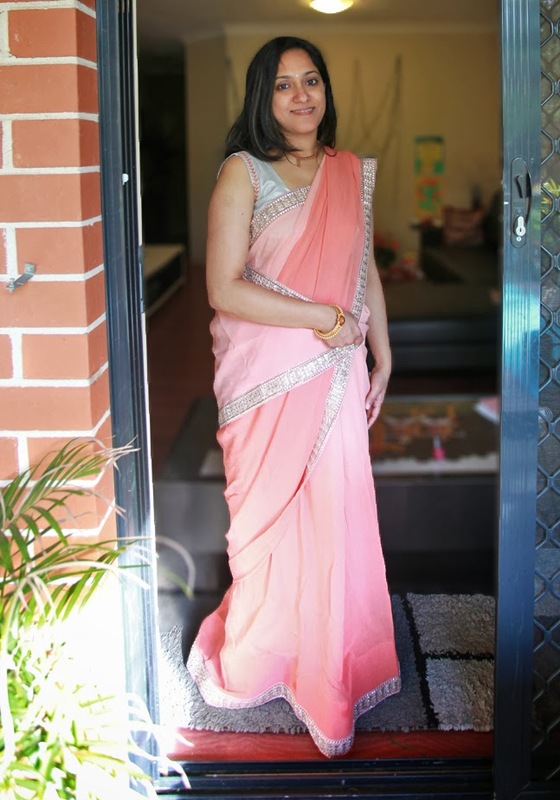 So-Saree Anniversary Guest Post_Klassy Style Files! And me for sure, seems to agree with that a lot. When the thought of first starting a Blogathon on So-Saree struck my mind, I knew one thing for sure; with my schedule this task is next to Impossible. I most certainly cannot do it alone. And that is when I decided to call my Gang of Bloggers Friends to do guest posts for So-Saree. And in spite of the tight time frame that I gave them, they managed to draft guest posts for So-Saree without any complaints but with a lot of love. 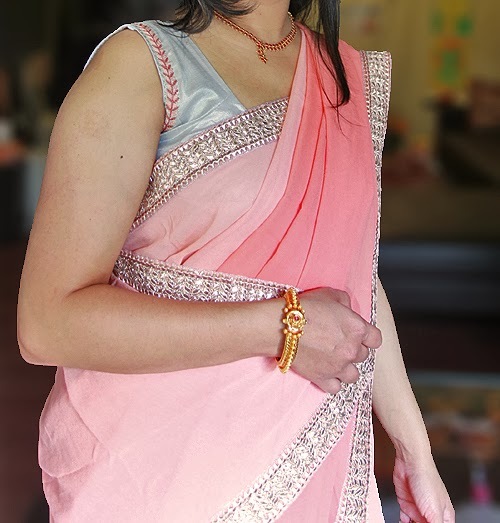 The first Guest post to go live on So-Saree, is by Kalyani of Klassy Style Files. Kalyani has already featured on So-Saree's list of Fav Mommy Bloggers. Her style is casual, chic and klassy, and I so relate to her fashion sense. So without much ado, I pass on the baton to Kalyani. First of all I'd like to congratulate Aditi on her blogaversary! I think she has done a wonderful job so far in sharing stories and sarees close to her heart :-) I'm really glad I could contribute to this special post. Unlike Aditi, I was not much of a saree lover, don't get me wrong..I loved the six yards of elegance but just hesitated to style it on myself.. until a while back! My romance with the saree is fairly recent and now I'm so much at ease with it that I tend to surprise myself. When I was in India last year I even managed to design one..and it was an extremely satisfying experience! It started with picking the perfect, most luscious chiffon and shading it with an ombre effect. I then picked an intricate lace in a copper shade for that festive touch and got the blouse made to compliment the saree in style. The compliments flowed in so generously when I sported this self designed creation that I immediately decided I had to expand my saree wardrobe. There have even been requests for more designer sarees..just like mine! So what next? Well, that's another story..! Thank you so much Kalyani. You look gorgeous in that saree, and I am so motivated to design a saree myself too. Kalyani blogs on Klassy Style Files, and you can follow her FB page here. Such a beautiful color....& Kalyani you look gorgeous in saree!! I'll be regularly visiting sosaree blog .... I really loved your blog ! I love the shade of the saree! and Kalyani u looking absolutely gorgeous! WOW kalyani your loooking fabulous!! I know..! M glad she agreed to feature. Thanks Aditi for this feature and all you lovely readers for your comments!! Wow she is looking fab !! Color of saree is so pretty.. This saree is so beautiful and colour is very light. you can also visit<"just4evesboutique.in/"for like this sarees.